To empower the people of Haiti to improve their lives by providing necessary and immediate aid, assistance, and support specific to those who require it with the objective of self-sustainability. 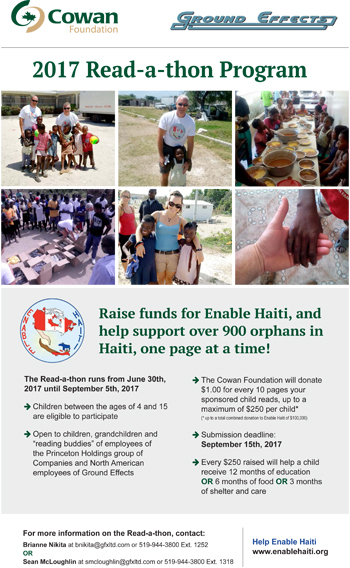 Thank you so much for your continued support of our charity, Enable Haiti! Your donations have been essential in benefiting the many people of Haiti, who are still struggling to recover fully from the earthquake of 2010. With your generous donation of funds, we have been able to continue our work that is dedicated to supplying the many needed items to a large group of orphaned children; families living in harsh remote areas; as well as the addition of another school of 226 children that we have agreed to support, taking over from a very special man, who has dedicated his life to these children, but has become unable to continue due to his old age, as well as a lack of funds to pay for teachers. While things are starting to look a little brighter for the people of Haiti, there is still much to be done and still so many in need. We have been fortunate to continue receiving many donated items from the general public at our plant in Windsor, and would like to sincerely thank our very own employee Kim Ring and her family, who generously volunteer their time to manage the packaging of these items for transport. We have also been so fortunate to have partnered up with a local canning company who have so generously donated thousands of cases of goods which will provide many families with much needed food. As well, we have received some medical equipment such as beds and medications that will benefit our adopted hospital. Our hearts are so grateful to those who keep us in mind with their many donations of such needed goods and funds. We were overwhelmed with the response to our call to package 120,000 meals recently at our plant in Windsor. Partnering up with ‘No Child Hungry’, an organization dedicated to helping end hunger worldwide, proved to be a wonderful experience for all who availed themselves to assist us in this great cause. These packaged meals consist of a balance of all the vitamins, protein, and carbs needed in a day, one package providing 6 meals. With the call being put out via one e-mail, we were able to have 580 volunteers come to our aid, working in various capacities, and accomplishing the greatest feat we have ever taken on, in a record time of 2 ½ hours!! We are so very grateful to all who answered the call and who generously made cash donations which helped to offset some of the food and shipping costs, and we will definitely be hosting another of these events next year, with a greater number of meals to package. Enable Haiti has also had the great opportunity of being the recipient of 300,000 packages of soup, generously donated by the Leamington Gleaners, who with a small daily volunteer of people, take fresh locally grown produce and process it into packages of soup, which is then sent worldwide to various people of need. This volunteer based process is done in an effort to use the 40% of locally grown food that would otherwise be taken to a landfill. There is always a need for volunteers to help in this effort, so please keep them in mind if you are looking for ways to volunteer your time in this worthwhile cause. We are on our way in one weeks time to receive and deliver these much needed meals to the people of Haiti who are still struggling every day to meet their needs. Our small group of companions that travel and devote their time to delivering the many items we receive has grown to include our children, James, Jessica and Jordan, along with the continued small base of friends who suffer the heat and environment to enable us to do this work. While we have many who wish to join us in our travel, we are limited in the number that can be transported around to deliver these goods, as well by the significant cost of travel, so our team is carefully selected. All of this good work would cease to be if not for the generosity of this community and the wonderful donations of needed items and funds…. and therefore, once again, I along with my family, friends and the very special people of Haiti, thank you all for your continued support.